These enchiladas are not the most photogenic food, but they are really really tasty. We took our inspiration from a recipe from Bon Appétit for mushroom crepes; we just took out the step of making crepes and replaced them with corn tortillas, and tweaked the sauce a bit (a little more flavor and a little less cream). The result is one of our staple meals. You could definitely use this sauce on all sorts of other things, or switch out the filling in the enchiladas if mushrooms aren't your thing. Heat the cooking oil in a large skillet over medium heat, then add the onions. Cook until they are just softened, about three minutes, then add garlic and cook another minute. Mix in the mushrooms and cilantro and season with salt and pepper. Cook until all the water has been cooked out of the mushrooms and they have started to brown (about 10 minutes). To make the sauce, you get to have a little fun with fire. 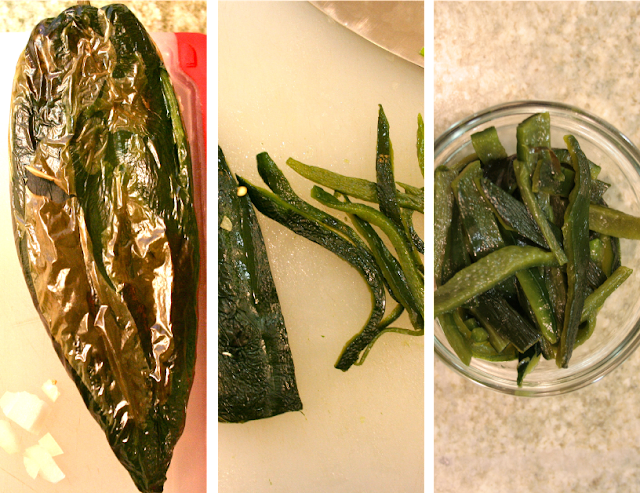 Charring the chile over (or under) a direct flame makes the skin blister and easy to remove. It is edible, but it's a little bit tough so especially in this application, where the chile is blended into the sauce, it's better to remove it. Turn on the broiler to high and place the poblano pepper as close to the flame as possible (exactly how you do this will depend on your broiler set-up). It's probably a good idea to put the chile either on a baking sheet or a piece of foil so that you can move it in and out easily. Keep an eye on the chile and as soon as the skin starts to blister and bubble, use tongs to turn it over and expose another side to the flame. Keep rotating the pepper until most of the skin is blistered. Transfer it to a plastic or paper bag and close the bag; let it sit for about 10 minutes. Remove the pepper from the bag and peel off the skin with your fingers. Roughly chop the chile and set aside. Melt the butter in a small saucepan over medium-low heat. Add the onion and let it cook until softened (3 minutes), then add the garlic and cook one more minute. Mix in the flour and cook until the mixture is bubbling (2 minutes). Whisk in the milk and turn up the heat to medium. Continue stirring until the milk has thickened. Pour the mixture into a food processor and add the poblano chile, chile powder, cayenne, and salt and pepper. Blend until smooth. Finally, put everything together. Preheat the oven to 375 degrees and get out a baking dish (our 8 inch square was a little too small; we had to put some overflow enchiladas in another little dish so if you have something bigger use that). Spoon some of the poblano sauce into the bottom of the dish (just enough to lightly cover the bottom and keep the enchiladas from sticking). Divide the mushrooms into 8 portions and scoop one portion into a tortilla. Add a light sprinkling of cheese (to hold everything together), then roll the tortilla and place it in the baking dish with the seam down. Continue doing this until you've filled all the tortillas, packing them in side by side. Spoon the rest of the sauce over the enchiladas, then sprinkle the corn on top and cover with cheese. Bake until the cheese is bubbling and beginning to brown (about 30 minutes). Serve with refried beans or rice or whatever catches your fancy. I love enchiladas. These ones sound quite delicious. Thank you! They are really yummy. There's an interesting decision to be made with enchiladas - what goes inside and what goes on top? We decided cheese belongs in both places. I like the sound of shiitake mushroom enchiladas!